Papergang is a monthly stationery subscription box from quirky UK design team, Ohh Deer. Each month they partner with a different artist and have a theme to bring you paper goods and desk accessories. Each month’s packaging is uhhh-mazing and acts as the perfect preview to the theme of the box. It’s designed by a featured artist each month and sometimes said featured artist is on the Ohh Deer team, as is the case this month. The eye-catching theme of boldly colored flowers and beautiful butterflies photographed against a bright white backdrop is the perfect welcome for spring. Plus, this month, they’ve paired up with the Butterfly Conservation and are donating £1 (a little over $1) toward protecting butterflies, moths, and our environment. The flip side of the box always features a cut-out craft, often by designer Daniel Randle. After a few months of simpler crafts, like bookmarks and things you could simply cut out and enjoy, we’re back to our regularly scheduled program of critters you cut out, fold, and display. I took a few months off from partaking in these crafts because I did such a dreadful job with ’em, but I gave it a go again this month. It wasn’t very successful—honestly, I was considering not even taking a picture to post—and then, seriously, my dog snatched it and ate it. I can’t make this stuff up. Haha! The Cost: About $14.51 USD (10.95 GBP) + shipping. 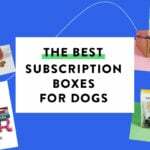 Coupons: Buy a 3-month subscription and save 50% off your first box, no code required, just link here! You can also get a free box with a 6-month subscription or 2 free boxes with a 12-month subscription! The Products: Each month you’ll receive a box full of papery goodness. The product selection will vary, however, it will include the likes of greeting cards, notebooks, desk accessories, and art prints. Ships to: the US and Canada for approx. $6.59 USD (£4.95), UK for $3.93 USD, Australia for $7.92 USD, and Worldwide (shipping costs vary). Good to know: In addition to donating £1 per box to Butterfly Conservation this month, Papergang has an ongoing partnership with Tree Aid to make sure that for every four boxes they sell, one tree gets planted in the African Drylands, which helps with vital food and income. Papergang includes a fun little info booklet each month that matches the box and theme of the contents! Shall we have a look-see? Under the front cover is a list with the contents of this month’s box (Box #37). On the opposite page is an intro that tells a bit about why they chose to team up with Butterfly Conservation. Papergang actually teams up with charities quite frequently, and this isn’t the first environmental one they’ve done! Here, Papergang gives some facts about Butterfly Conservation, paired with a hopeful quote by Sir David Attenborough, one of my personal heroes. If you don’t know his name, you probably know his voice—he narrates many nature documentaries. The next page shows a bunch of past boxes all together—my, how they make my heart flutter! And then, the usual head’s up about their awesome referral program. Find out more info about their referral program at papergang.ohhdeer.com/faq. On the back is a list of suggestions sharing how you can help the butterfly populations revive and thrive! I’m always so eager with anticipation to see what type of item(s) will have the top-notch box design on it. I follow Papergang on Instagram, so I was expecting the beautiful flowers on my doorstep, but I didn’t catch any sneak peeks on my feed (now that I look back, I see that they did post a couple). I love this deskpad! I’ve received a deskpad once before from Papergang and loved that one, too. I put the first one on my home desk, but then we moved that desk up to our third floor for a semi-storage situation when we got a keyboard, so the deskpad is waiting to be used again, but I did jot things down on it when I used it more frequently! I think I’ll bring this gorgeous pad to my office desk at work. Here are a few close-up shots of the various boxes provided. I’m always a fan of notebooks and notepads offering a doodle section. It’s so realistic! Like, we’re gonna doodle. Might as well allot space! This is another great desk item that I’ve received a version of in the past. Last time around it was silver airplane-shaped paperclips for a travel-themed box, and this time its black butterflies. I’m a sucker for a novelty paperclip and wish I had more uses for ’em. I’m totally content to keep them in my desk drawer just waiting, though! Anytime someone at work asks if I have a paperclip I’m like, “YES and you’re gonna be so happy you asked me.” Other than pens, I’m so down to share my office supplies. Just don’t touch my pens. Wow, this is a gorgeous pin. I’m here for the enamel pin trend that’s been going steady for a few years now! I have a couple of great ones attached to the breast pocket of my jean vest (I know, I’m a badass, you don’t have to tell me) and this black and gold moth would be a really fitting addition. My only feedback is that I wish it had two posts. The backs have a way of shimmying off of pins if you wear them often enough, and I’ve nearly lost some that were saved by the second post’s back staying intact. I’ll have to be careful with this one. I’ve received a handful of art prints in Papergang boxes and loved every single one. The first one I got was in March 2018 and is actually framed and hanging in my daughter’s nursery. She loves it and babbles at it from her changing table! January’s box also featured a set of art prints, and in that review I mentioned that I loved their textbook illustration style, but didn’t think their neon pink color would go with my decor. I like the purple butterflies on the one print of this set of three better! All three have gold foiling on them—so pretty. A closer look. I’m not sure where I’ll hang these…I’m running out of wall space in my house! But maybe I’ll save them so I can switch some art out down the line if I feel the need to freshen things up. And, here’s a classic Papergang offering: a riso calendar. For the second month in a row, there’s no specific month indicated on there, so you can fill it in with whatever month is useful to you. I hope this is the new way of the riso calendar! Every so often, Papergang tosses in some sort of promotion or discount code. This is a 20% off code to jewellerybox, a UK site that reminds me of Claire’s here in the US. Verdict: Papergang can do no wrong in my eyes, though this month featured items that were kind of a slow burn for me. By this I mean I will put the pin on my vest, the paperclips in my desk drawer, etc., and just patiently wait for the time when they’re worn/used. That’s fine! Not every month can offer pens and stickers—that would get boring! (Maybe. Maybe not.) I received a deskpad, butterfly-shaped paperclips, an enamel pin, a set of 3 prints, and a bonus riso calendar, which added up to about $44.32 USD. That’s the best value for this box that I can recall! For an approximately $21.10 (box + shipping to the USA) box, it’s an amazing deal. Can you still get this box if you sign up today? No, you’ll receive the April box! Check this helpful ship date guide to see the order-by date to receive the next few months’ boxes. Coupon – Buy a 3-month subscription and save 50% off your first box, no code required, just link here! 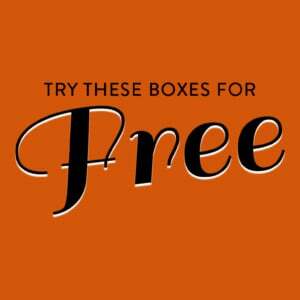 You can also get a free box with a 6-month subscription or 2 free boxes with a 12-month subscription! Value Breakdown: This box costs $14.51 + $6.59 shipping, which means that each of the 5 items in the box (counting the bonus card) has an average cost of $4.22. Check out all of our Paper & Stationery Subscription Boxes and the Artisan Subscription Box Directory! Did you like this month’s Papergang box much as I did? Don’t forget to check out their blog to download their free monthly wallpapers. This month it’s those beautiful flowers! I was a little disappointed in this box because the design was so beautiful, and the desktop pad had the design so muted. The art prints are nicer than most of the others we’ve received, and very pretty, but art prints aren’t a hit for me. Also, my box came with one end open and there were no butterfly paperclips inside. 🙁 I think the box just got squished in transit and opened but it was disappointing. I’m going to give papergang another month or two – April’s design seems cool… but the fact that I have to sign for this package means I always end up having to make a special trip to the sorting post office which isn’t very convenient for me… so odds are I will end up canceling because of the sign-on-delivery aspect. I loved the desk pad but I totally agree on the prints, they are useless to me. This month didn’t seem worth the price, like all my other months. Sadly I’m done with them. I got 4 months and not one month was really wow to me, too many non-useable items in my opinion. It’s funny, I had to sign 1 month a few months ago, but not before that nor since. I couldn’t figure out what was unique about that one month! I understand that such a requirement feels like a lot of effort for a box of “just for fun” items that might not have immediate uses. But I also agree that April’s design looks amaaaazing so I’m glad to hear you’re waiting it out!